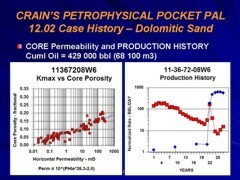 Publication History: This article is based on "Crain's Petrophysical Pocket Pal" by E. R. (Ross) Crain, P.Eng., first published in 1987, and updated annually until 2016. This webpage version is the copyrighted intellectual property of the author. In order to determine the economic potential of a well, it is necessary to predict the production profile and economic life of a well from the reserves and flow capacity established by log data. Some assumptions must be made, as usual. These are the final production rate (Qa) below which it is uneconomic to produce the well, the annual exponential decline rate (D) and the initial deliverability (Qd). In some jurisdictions, initial flow rate may be restricted by market demand or legislative control, or by good engineering judgment, common sense, or facilities restrictions. If this kind of production occurs, we assume the initial production rate (Qi) to be constant until this rate equals the well's ability to produce. Thereafter, production will decline at the exponential rate. This routine presumes that recoverable reserves are known from some other source, such as volumetric analysis from log data, decline curve analysis, or material balance calculations. Set R in the equations below to equal Roil or Rgas, then proceed. The instantaneous decline rate (E) is found by. The annual decline rate is. Life of well on decline is found as follows. If the well is restricted to a constant rate. The reserves produced on decline are. The reserves produced at constant rate are. The life at constant rate is. The total economic life is. The constant rate lengthens the life and reduces the profitability of the well, as will be seen in the next section.